10 Reasons To Use Apple Vinegar Everyday! Apple vinegar is one of the two most recommended natural remedies and I use it almost everyday, along with coconut oil. I use it and celebrate it for several reasons, including detoxification, improved digestion and as a natural energizer. In addition, it can be used as a key ingredient for personal care as a conditioner, to whiten teeth and as a household cleaner. There are several medical studies suggesting that the use of apple cider vinegar can help cure reflux or heartburn, blood pressure, improve diabetes, and support weight loss. The benefits of apple vinegar come from powerful healing compounds, including acetic acid, potassium, magnesium, probiotics, and enzymes. Acetic acid has the ability to kill dangerous bacteria and at the same time promote the growth of beneficial bacteria. Because acetic acid kills unwanted bacteria, it essentially acts as a natural antibiotic. This leads to many benefits related to skin, digestion, immunity and health, and no side effects :). In addition, apple cider vinegar is a good source of polyphenols. Research supports the role of polyphenols in the prevention of cardiovascular disease, cancer, neurodegenerative diseases such as Alzheimer's, osteoporosis, and diabetes. Be sure to buy raw apple vinegar with the "mother" which means it still contains the beneficial compounds including probiotics. Apple vinegar is a natural depurative of the liver and a lymphatic tonic that helps detoxify your body. It helps balance the body's pH and stimulates the cardiovascular system, intestinal mobility and lymphatic drainage. Can be used as a natural hair conditioner, and gives it a lot of shine. Take an empty bottle of shampoo, then fill it with 1 tablespoon of apple vinegar and 1 cup of water. Pour this into the hair after shampooing three times a week for best results. Bad bacteria and yeasts are a major cause of body odor. The armpit can remain moist which also makes it a breeding ground for bad bacteria. Simply rubbing a little apple vinegar on your fingers and running in the armpit can kill the yeast and neutralize the odors keeping it smelling fresh all day long. One of the most common uses is as a natural tooth whitener. Use apple vinegar with a finger and rub it on your teeth for 1 minute. Then rinse the mouth with water. The pH of apple cider vinegar can remove stains from teeth that help naturally whiten. Some of the main causes of reflux, heartburn and heartburn are an unbalanced stomach pH and lack of enzymes and probiotics. Cider vinegar is full of all these nutrients. 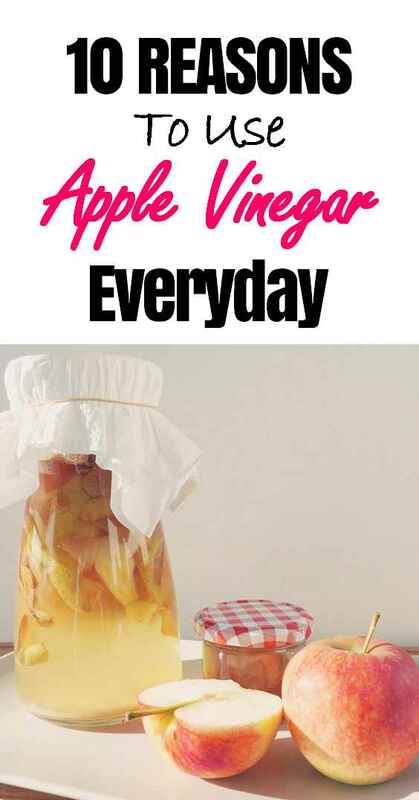 Add 1 tablespoon of apple vinegar in a glass of water and drink it five minutes before meals. Millions of people around the world struggle with Candida and fungi. Side effects can be bad breath, lack of energy and digestive problems. Vinegar contains probiotics and a type of acid that promotes the growth of probiotics that help kill Candida. Remove sugar from your diet and consume 1 tablespoon of apple vinegar a day as part of a yeast cleanse. A study published in the Journal of Diabetes Care found that consumption of apple vinegar may promote weight loss. There are several reasons, it promotes fat loss, reduces sugar cravings, and improves detoxification. Another study found that acetic acid supplementation found in apple cider vinegar reduces body fat in mice by 10%. The anti-bacterial properties and balanced pH of apple vinegar make it a perfect household cleaner. Fill a spray bottle with 50% water and 50% vinegar then spray windows and surfaces for cleaning. Mix a 50/50 solution of vinegar and water to invite your pet to enjoy a tub. Do this once a day for several weeks to get rid of flea pests. Medical research has shown that the acetic acid found in apple cider vinegar can balance blood sugar and improve diabetes. Put apple cider vinegar in salads or consume 1 tablespoon dissolved in water before meals. In a 2009 12-week study they found that consumption of apple vinegar lowered triglycerides and blood pressure significantly. Another miracle cure is for allergy. Vinegar helps break down the mucus in your body and support lymphatic drainage. Apple cider vinegar is the ultimate remedy to cure a quick cold and malaise in general! Because it is loaded with vitamins and acetic acid boosting probiotic is a great natural remedy. Take 2 tablespoons of apple vinegar in a glass of water 3 times a day. The pH of apple vinegar makes it an excellent remedy for skin problems. Rub apple vinegar in an area or use it to wash an area then put coconut oil and essential oils in the area to further support healing. The anti-bacterial and anti-fungal compounds in apple cider vinegar make a great natural cure for skin and nail fungus. Simply rub on the area of 2x mushroom daily. In addition, the use of a mixture of coconut oil and oregano oil is ideal for killing the fungus. Put apple cider vinegar typically on the wart and then cover in band aid or bandage. Leave to act overnight and remove in the morning. You can see the results in a week or it could take longer. Thousands of people have sworn that apple cider vinegar cured warts and other skin problems. This is just some of the many uses of apple vinegar, it has been consumed for about 5,000 years! 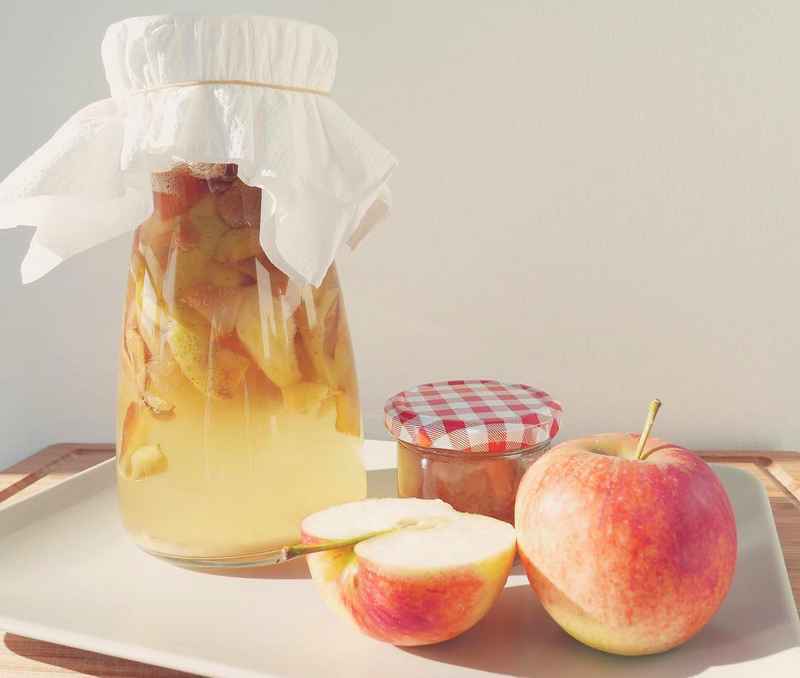 Historical records show that apple juice has been fermented in vinegar since before 5000 BC. Throughout the ages, apple cider vinegar has been used to stimulate circulation, aid in liver detoxification, to purify the blood, cleanse lymph nodes, and improve immune system response. In fact, Hippocrates often prescribes it for coughs and colds when mixed with a touch of honey. Vinegar is produced in a similar way to other fermented drinks Kombucha, Kefir and Wine. Like all fermented products, apple cider vinegar is made using an active yeast that is combined with the natural sugar of crushed apples. The yeast actually consumes the sugar and uses it to grow healthy bacteria, which is how fermentation takes place. The best apple vinegar for more therapeutic use should be made from certified organic apples, no pasteurization is necessary. The acidity of vinegar is sufficient to prevent unhealthy bacteria (including E. coli) from developing. After the fermentation process is complete, the result is the formation of acetic acid, the main beneficial compound in apple vinegar. Sometimes it may seem cloudy or have "cobwebs", but this is a good thing. This cloudy brown appearance of LCA, as well as the yeast strands that may be present, are actually a sign of the fact that the cider is of good quality. These filaments are living yeast fragments, and they are actually living. Although fructose is used, the sugar is consumed during fermentation, so almost none of that is ingested in the finished product. It has about 5.3 calories per tablespoon, and a little usually goes a long way. So they end up with a very beneficial drink and practically no calories or sugar. In fact, one of the biggest benefits of consuming vinegar is that it has a positive effect on blood sugar levels, helping to keep them stable and reducing the risk of diabetes or hypoglycemia. Where to buy apple vinegar? It is important to keep in mind that not all apple vinegar is created equally! To get the most out of using LCA, be sure to buy raw and with the "mother" intact, which means it still contains the beneficial compounds including probiotics. It is imperative that you select organic apple cider vinegar, unfiltered, unpasteurized and reap its many health and beauty benefits. Rule number 1? Look for cloudy vinegar; this is the sign that the friendly enzymes and bacteria that promote healing have not been eliminated. Yeast strands is what is known as the "mother" (the mother of probiotics). One of the best brands of local and organic production is Saludix Flora. After seeing all these benefits that apple vinegar brings to your health you should not hesitate to start consuming and using it. Don't wait any longer.